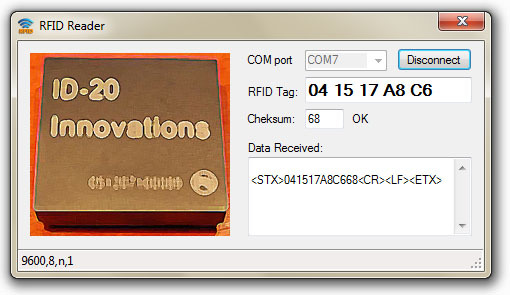 “RFID Reader” is a simple software that connects to serial port and retrieves data from RFID Readers such as Innovations ID-12 or Innovations ID-20. Serial port is user-selectable from a list of available ports. Serial port settings are fixed at 9600,8,n,1 so other readers using those settings can be interfaced with this software (please let me know if you use this software with an RFID reader different from ID12 or ID20). When you place a tag in front of a connected reader module, software puts data received in the “Data Received” text area. Special characters are displayed as <char>. In the “RFID Tag” text area is only shown the tag code. The Checksum box show computed checksum of the tag code. Software matches computed checksum with checksum received on serial port. If both checksum equals, an OK label is shown near checksum textarea.